Die Staaten von New York, Pennsylvania, Maryland, New Jersey, Delaware and Virginia. 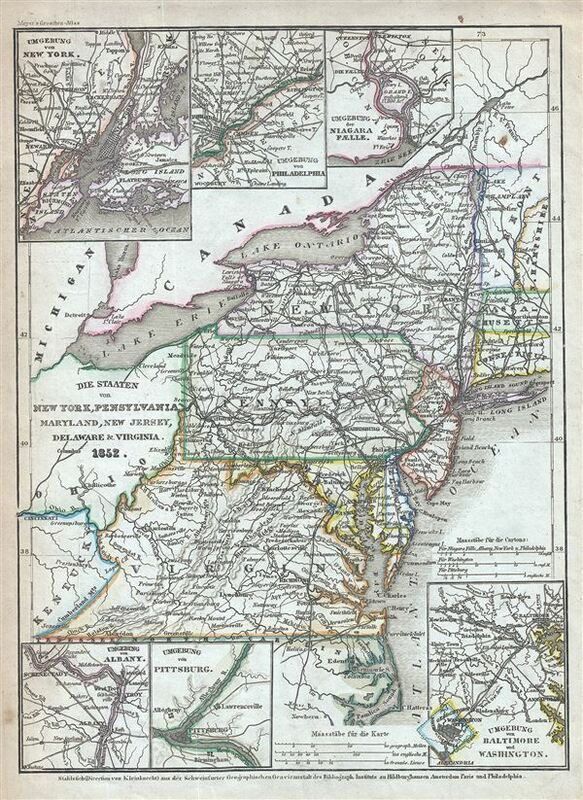 This is a fine example of Joseph Meyer's 1852 map of the Mid-Atlantic States. It covers New York, Pennsylvania, New Jersey, Maryland, New Jersey, Delaware and Virginia as well as parts of Connecticut, New Hampshire, Massachusetts and Vermont. Six inset maps are also included. These feature New York and vicinity, Philadelphia and vicinity, Niagara Falls and vicinity, Albany and vicinity, Pittsburg and vicinity and Baltimore and Washington DC and vicinity. This map covers Virginia before it was divided into West Virginia, and Virginia. This map was issued at the height of the American westward expansion. A few years before this map was drawn the California gold discovery of 1849 enticed thousands to embark upon the rigorous transcontinental emigration. Meanwhile, with the rise in territorial population to the west of the Mississippi, the eastern states were becoming increasingly divided over the issues of slavery and state vs. federal sovereignty. In Virginia, around half a million people were enslaved. Within five years these disputes would lead to the American Civil War. The war would prove particular hard on Virginia as it hosted both the Union (Washington D.C.) and Confederate (Richmond) capitals and saw more Civil War battles than any other state. The Chesapeake Bay region was also the seat of the Civil War and many of its most important battles took place here. The Battle of Gettysburg, considered a major turning point of the Civil War, was fought in southern Pennsylvania in 1863. On another note, shortly after this map was this map was drawn, in 1859, oil was discovered in western Pennsylvania, leading to America's first oil boom and fueling the fortunes of John Rockefeller and others. Very good. Minor overall toning and some foxing at places.